I started keeping little journals, and I eventually wanted to self publish them and make them by hand. I thought by taking a book making class I would learn how do just that. I learned various ways of publishing and different binding styles, but I never really got around to it. When I was visiting my niece, Gabriella, in Brazil this past summer, she saw my journal I was writing in and wanted one just like her favorite aunt. 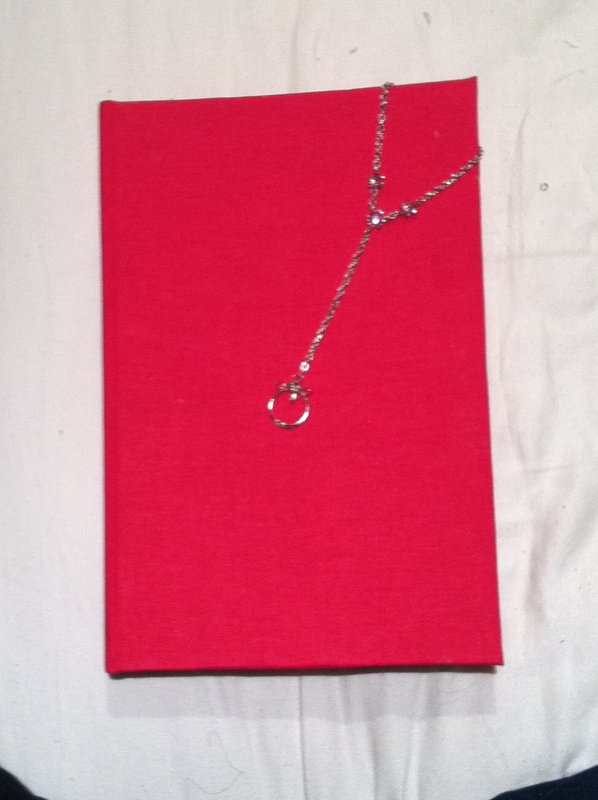 So when I came back to the states, I made one for her with the book cover in her favorite color, PINK. I usually only see my brother and his family once or twice a year, but I was lucky enough to see them just last week at our sister Melanie’s wedding, which is when I gave Gabriella her journal. So here I will show you how I made Gabriella’s journal. The supply list seems excessive, but the more you have, the easier the process will be. I apologize for such a long post, but the process requires much attention. Please read each step BEFORE moving forward. I will do my best to explain the process, if there are any questions feel free to ask them. step 1– with you bone folder, fold your pieces of paper in half and group them into 4, so you have 20 signatures. you can have more or less signatures depending on how thick you want your book. * a signature is a section of pages in a book, each signature has 4 pieces of paper that make 16 pages. step 2– once you have your signatures all put together, line them up at the spine (folded edge) and draw 4 evenly spaced lines down each of the signatures. step 3– with an awl, or sharp, needle-like object, poke holes in each of the signatures where you marked it, being careful that your signatures are lined up. * some people put one side of the signature when making the holes for support. 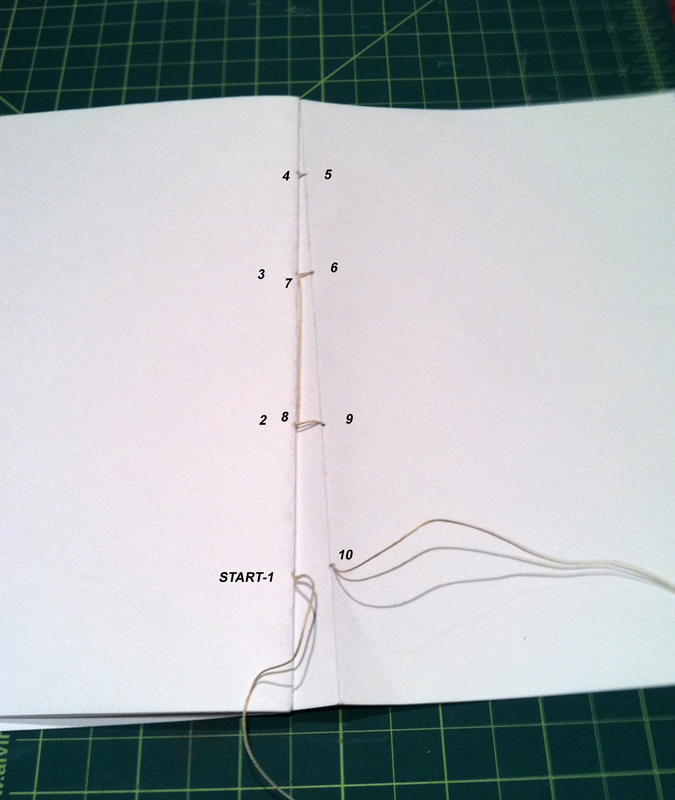 step 4a– cut a piece of binding thread, I cut mine the length of my signature and multiply it by the number of signatures I have, plus 1. It’s always better to have more than not enough. thread your needle with the binding thread and begin sewing. 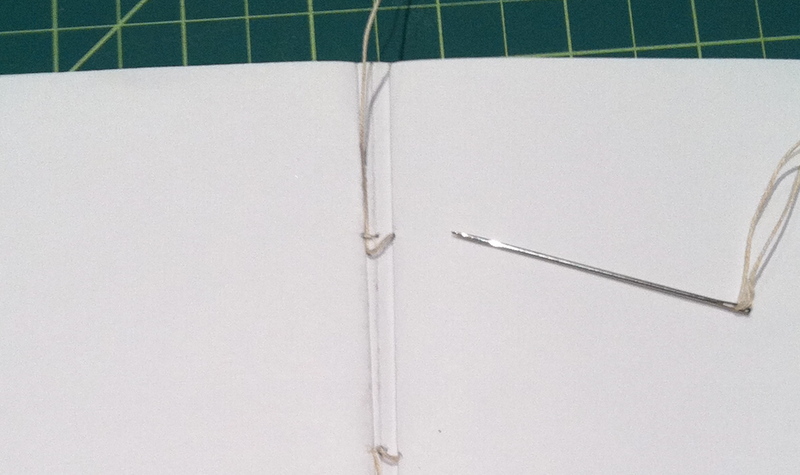 step 4b– begin at the bottom of the last signature and sew a running stitch of the spine, leaving a tail at the end. add the next signature by sewing into the top and down to the 2nd hole. when you come up from the 2nd hole, sew into the 2nd hole from the previous signature and up from its 3rd hole. sew back into the 2nd signature, this time into the 3rd hole and finish the running stitch. step 4c– tie the tails from the first two signatures, BUT DO NOT CUT. add on the next signature and sew to the top. once you’ve reached the top, before adding the next signature, insert the needle into the top stitch between the first 2 signatures. *keep in mind to tighten your stitches so your book will be nice and tight together at the end. step 4d- repeat the sewing process with a running stitch and sewing back into the previous signature and looping into the stitch. when you get to the end, loop and tie off with a knot. 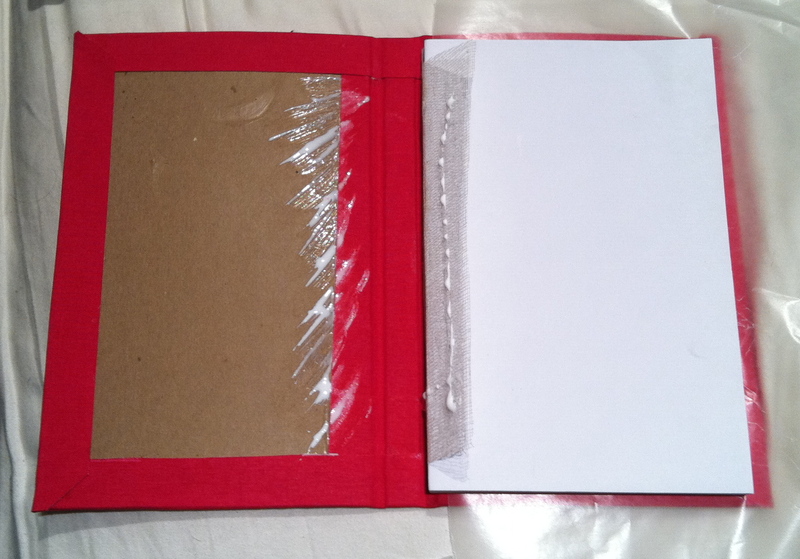 step 5– apply glue to the spine and clip together. let dry. 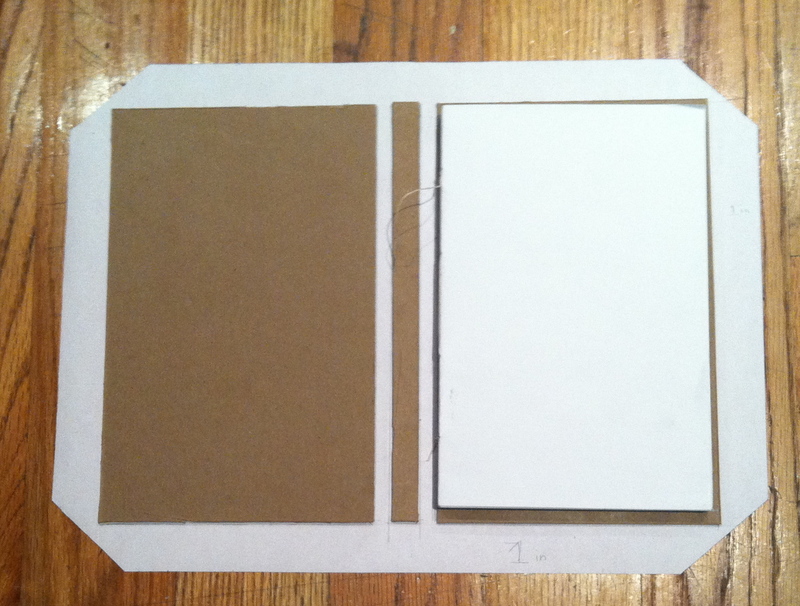 step 6– cut a piece of super cloth measuring the length of your pages, and 1 1/2 inches wider on each side. apply glue to the spine, put the super cloth over the spine and apply more glue. let dry. step 1– now that you have your book pages measure the edges as well as the thickness. find the grain* of the board and measure it so it is vertical for the cover. you will need 2 board pieces for the front and back, and a piece for the spine of the book. * cut the front and back 1/4in. larger on 3 sides (top, bottom and edge of pages), so the spine is flush with the edge of the board. cut the piece for the spine the same size as the spine. to cut the book board BE PATIENT! score the board several times with a box cutter against a straight edge. if you feel comfortable to cut through the score marks without the ruler, do so. otherwise keep on running the blade through until you go all the way through. * you can omit the spine piece for a soft, slightly rounded spine. step 2a– place your pieces onto book cloth. space the spine between each board with 2 book-board-widths on each side. (i usually leave a bit extra for easier closing of the book, but either way it needs this space to close.) trace the boards in their places and measure at least 1 1/4 ins. around all four sides. cut the book cloth to the size needed. step 2b– at the four outer corners of the pencils markings measure 2 book-board-widths. cut the edges. 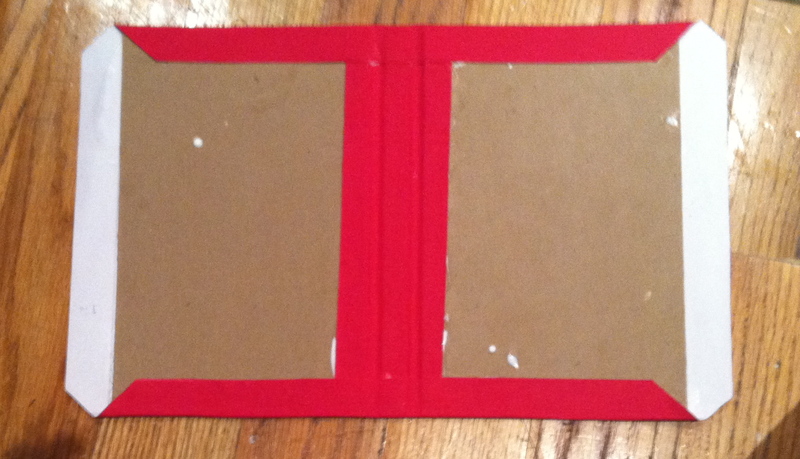 step 3a– apply glue to the book cloth and book board and glue together. flip it over onto a piece of wax paper and smooth with your bone folder. when you flip it back over, be sure to remove the wax paper that may have glue on it. *the best way to apply glue is to make a zigzag all the way down, then starting from the center, brush outward. step 3b– cut a piece of book cloth for the spine as I have done,if you’d like, but it is not necessary, and glue down. step 3c- starting with the top and bottom, apply glue to both sides and fold the book cloth over and smooth with bone folder. do the same for the sides, but pay extra attention to the corners. 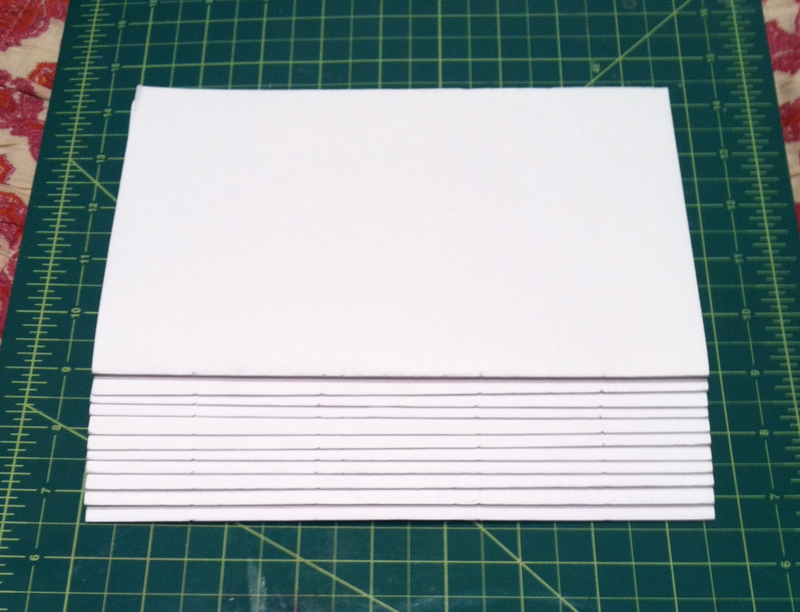 step 4- fold each piece of card stock and with your glue stick glue onto the first and last pages of your book pages. step 5a- put a piece into between each of the pieces of card stock and apply white glue to book board and the back of the last (card stock) page. line up the spine with the edge of the book board and glue down. step 5b- do the same on the other side, but when you close the book, do not open it. keep it closed under a stack of books overnight.